Surround system. The new 18 inch flagship comes with the quad core processor, Intel Core i7-2630QM, and the Nvidia GeForce GT 555M graphics solution. Not only are the 16 GB RAM and the installed speedy SSD striking, but the touchpad as well. It can be removed and used as a remote control. The steep price for the notebook: 1699 euros. Acer announced new models of the Acer Aspire Ethos range in June. The model Acer Aspire Ethos 8951G is available in the most various alternatives in the meantime. The predecessor of the previously reviewed Acer Aspire Ethos 8950G belongs to the heavyweight category with just under four kilos. Acer's 18.4 incher is available starting at 1300 euros, depending on the configuration. The Taiwanese manufacturer relies on Intel's quad core, i7-2630QM , together with Nvidia's Geforce GT 555M for this. The combination of the quad core processor, based on the Sandy Bridge architecture with a base clock of 2 GHz, and the fast midrange graphics card are to supply multimedia and game fans with the needed power. Our test device, called 8951G-2631687Wnkk (LX.RJ202.059), has a price of about 1699 euros. The buyer gets a fast solid state drive, model Intel X25-M, with a memory capacity of 120GBs, though. And there is also quite a bit of main memory available because Acer has equipped its Aspire Ethos 8951G with 16 GB of DDR3 RAM. Acer has also installed a 750 GB hard disk (7200 revolutions per minute) from Western Digital for the other memory requirements. A BluRay drive has also not been forgotten. The manufacturer provides an optical drive from Matshita for this. 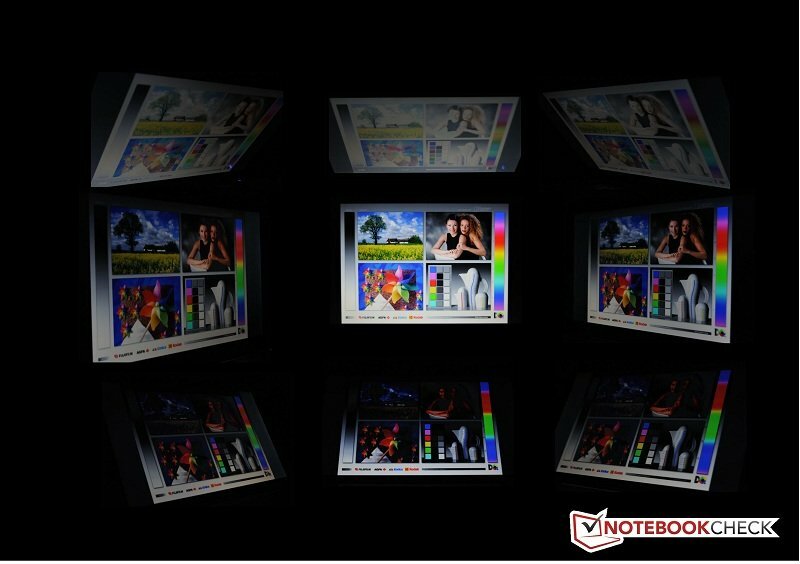 The 18.4 inch sized Full HD display supplies a maximum resolution of 1920x1080 pixels. The 5.1 sound system, which promises a great sound experience, is one of the special features. In addition, the touchpad can be removed and used as a remote control. Moreover, features like USB 3.0 or a fingerprint reader have also been installed. Find out how the "luxury version" of Acer's Aspire Ethos 8951G fares in our tests in the following review. Acer's Aspire Ethos 8951G's case is made of a blend of plastic and aluminum-magnesium. There are no alternative colors. The multimedia notebook is only available in black. The matt, self-proclaimed "Premium Design" comes in a brushed look. There are no significant changes compared to the previous model. The case proves to be quite stable. It can hardly be depressed around the keyboard. This also applies to the base plate. As so often, that looks a bit different for the display lid. The material clearly yields. The screen can also be twisted a bit. The display hinges do their duty well and provide a good grip. Fingerprints are quickly seen on the aluminum surfaces. In return, such stains are hardly seen on the plastic area around the touchpad. The workmanship makes an overall solid impression. With almost 4 kilograms, the Acer Aspire Ethos 8951G definitely belongs to the heavyweight notebook category. The 18 incher's dimensions of 39 mm x 440 mm x 295 mm (height x width x depth) also don't exactly make the laptop portable. The size and weight sooner indicate a desktop replacement computer. Our Acer Aspire Ethos 8951G bids quite a few interfaces. A HDMI port is just a matter of course as an S/PDIF port. In addition to three USB 2.0 ports, a fast USB 3.0 port has also been installed. All interfaces are located on the notebook's sides. Regrettably, all ports are placed very tight so that a cable mess can quickly develop. The built-in fingerprint reader and a preparation for a Kensington cable lock ensure increased security. A 1.3 megapixel webcam is built into the display bezel. You can build up a total of three, different ways of communication with the Acer Aspire Ethos 8951G. First, there is a gigabit LAN port (Realtek RTL8168/8111) available. The latest version of Bluetooth 3.0 +HS is also installed. And a WLAN module hasn't been left out, either. Acer relies on an Atheros AR5B97 wireless adapter (bgn) in this case. Merely a UTMS module hasn't been built into the system and would have to be retrofitted via an external USB device. The scope of delivery turns out rather sobering for this price category. Besides the notebook and the according power adapter, merely manuals, a security cable for the touchpad and a BluRay demo DVD are included in the big box. You could actually expect a few more accessories for this proud price. Acer bestows its top Aspire Ethos model with a 24 month bring in warranty. Beyond that, the Taiwanese corporation offers a warranty extension for an additional 12 months. The customer has to pay 39 euros for this. In our opinion, a fair deal. The installed keyboard is the same unit as in the previous model, Acer Aspire Ethos 8950G – its only black in our model. The laptop's format allows well-sized keys. Naturally, there is room for a complete numpad. The light for all keys can be turned on by a touch of a button. It facilitates typing in dark surroundings. However, the brightness level can't be controlled. The keys are partly somewhat wobbly. Nevertheless, the keyboard supplies a pleasant typing feel. The touchpad is one of the special features in this Acer notebook. It can be completely taken out of the notebook by a sliding mechanism. Thus, the touchpad can also be used as a remote control. In contrast to its predecessor model, the Acer Aspire Ethos 8951G now has multi-touch functions. The input device's size has also been adequately selected. The touch-sensitive media console can be opened via a button installed on the top. It allows control of the manufacturer's own software, volume control or to fast forward to the next track. There is a preparation for a cable so that the touchpad doesn't fall into the hands of a thief. The touchpad can also be connected to the Kensington security preparation. Basically, an impressive, innovative idea. Like in the previous model, Acer uses a display from Chi Mei Optoelectronics that only provides slight improvements (higher brightness). The Acer Aspire Ethos 8951G's display has a remarkable diagonal size of 18.4 inches. The Full HD screen, model CMO1807, has a 16:9 aspect ratio. This format frequently reduces the known black bars in movies or lets them disappear. The maximum resolution is 1920x1080 pixels like its predecessor. So, enough room to work with two adjacently opened windows. The given display brightness couldn't exactly overwhelm us. We measured an average of only 174.4 cd/m2 with Gossen Mavo Monitor. We could only selectively measure a maximum of 183 cd/m2. You would actually expect more of such an expensive model. This could considerably limit movie enjoyment and gaming fun in unfavorable ambient light conditions. The illumination of 89 percent is at least homogenous. The assessed black value of 0.9 cd/m2 has turned out a bit high. This consequently results in a rather weak contrast of only 202:1. Here, we definitely find one of the Acer Aspire Ethos 8951G's biggest weak points. A look at the previous 8950G shows that Acer hasn't made any improvements in this area. It even almost looks as if it has been based on the previous screen. The display is only suitable for outdoor use with massive restrictions because the display is reflective. This is practically a death sentence for outdoor use with the low brightness. Theoretically, you can only work a bit with the laptop in strong shade. But that isn't exactly convenient over longer periods of time. The screen can't excel with its viewing angle stability, either. While the picture only shows a minor weakness in horizontal deviations, the picture is already distorted after a slight vertical change. Cutting edge technology is hidden under the 18 incher's hood. Acer relies on the Intel Core i7-2630QM model, based on Sandy Bridge architecture, for the processor. The "QM" in the model name indicates that it is a quad core processor, so a processor with four cores. The CPU can process 8 threads at the same time thanks to Hyper Threading. The base clock is 2 GHz and can be even increased by Turbo Boost. Thus, a clock rate of even 2.9 GHz is possible with appropriate cooling. The Intel HD Graphics 3000 is also incorporated in the Intel Core i7-2630QM. Acer uses a graphics chip from Nvidia for a higher video performance. The midrange graphics card, Nvidia GeForce GT 555M, is used here. The system can switch between both graphic cards as needed thanks to Nvidia's Optimus. Consequently, a lot of energy can be saved. The graphics card with the GF106 core supports DirectX11 and OpenGL 4.0. The core clock is 590 MHz. The graphics card only has a slow DDR3 RAM available. A GDDR5 VRAM would have been desirable. Acer has definitely not made cutbacks in terms of main memory. A total of 16384 MB DDR3 RAM (PC3-8500-1066 MHz) is in the case. A fast SSD, model Intel X25-M, with 120 GB is used for the operating system. A 750 GB HDD from Western Digital is ready for the remaining memory requirement. As usual, we checked the processor performance with Maxon's Cinebench software. The Intel Core i7-2630QM system benefits considerably thanks to its four cores when the software is programmed for several cores. 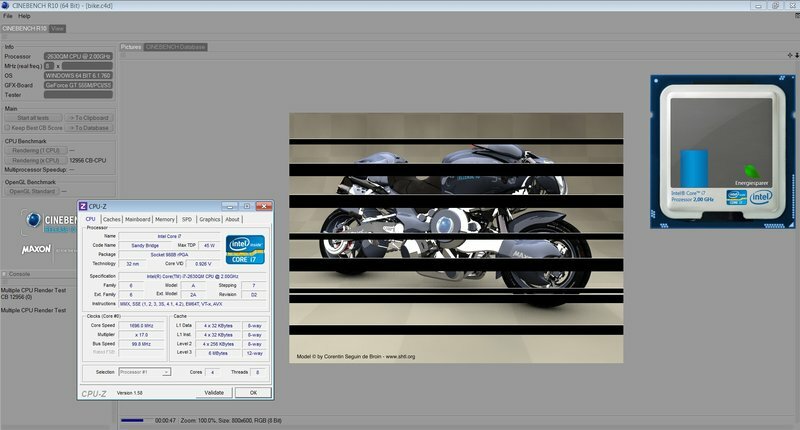 This can also be seen in the test, Cinebench R10 Rendering Multi (64bit). The system places itself in the upper quarter of our benchmark database with 13512 points. Nevertheless, the Acer model is the weakest system with an Intel Core i7-2630QM. In comparison: Dell's Inspiron Queen Q15R achieves 17320 points with the same CPU. It also looks the same in the Cinebench R11.5 CPU (64bit) test. The Acer Aspire Ethos 8951G again is in the upper quarter and is the weakest system with Intel Core i7-2630QM at the same time. The Asus G73SW-TZ83V achieves 5.0 points, while our test model only reaches 3.9 points with the same CPU. The reason for the poor performance in comparison to systems with the same processor is a problem with Turbo Boost. 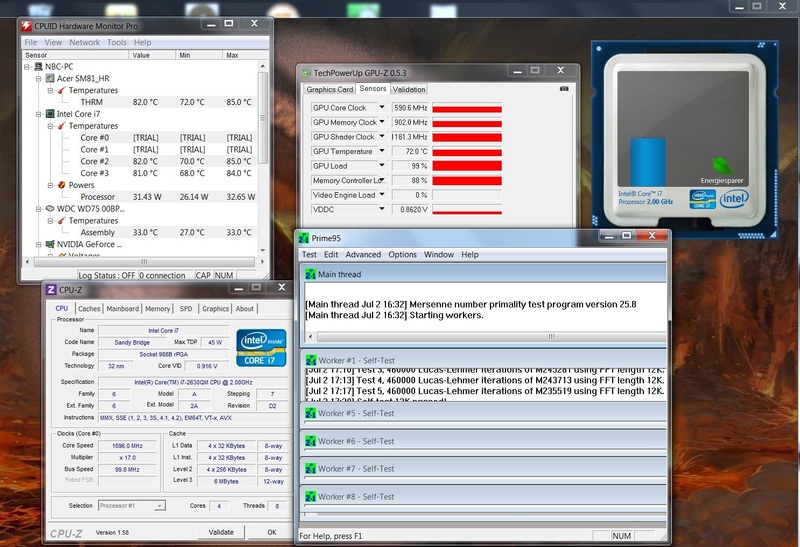 The Intel processor only achieves 2.6 GHz for a short time in the Cinebench R10 Multi Test (64bit). The clock partly drops to 1.7 GHz, as can be seen on the screenshot. We simulate the test device's application performance with the benchmark tools PCMark Vantage and PCMark 7 from the software developers Futuremark. The Acer Aspire 8951G places itself in the front ranks with 11637 points in PCMark Vantage. The laptop, Alienware M14x with the same CPU and GPU, clearly achieves more points (14302 points) in PCMark Vantage. However, the Dell model, XPS 17-L702X, reaches considerably fewer points (7649). The system currently is on the 4th place in PCMark 7 (status: 06. 28. 2011). The Alienware Notebook M14x again achieves more points, even if only fewer (3595 points). Overall, a top performance in terms of application performance, which is mainly due to the installed SSD. The built-in graphics card, Nvidia GeForce GT 555M, has to show its capabilities in the 3DMark series from Futuremark. Acer's Aspire Ethos 8951G reaches 10068 points in 3DMark06. Thus, the test device accomplishes the leap into the upper midfield of our test database. We can also apply 3DMark11 since the graphics card supports DirectX 11. With 1247 points, the 18 incher places itself in the midfield compared to other notebooks with the same graphics card and same processor. In addition to that, we checked the gaming performance with a few games. Acer uses a combination of a solid state drive with 120 GBs and a 750 GB HDD from Western Digital in the luxury version of Acer's Aspire Ethos 8951G. The operating system is installed on the Intel X25-M SSD. The SSD's rates are a lot higher than those of a conventional HDD. Consequently, the SSD achieves a score of 416 points in the AS SSD benchmark at a sequential read speed of 246.77 MB/s and a write speed of 82.97 MB/s. The installed HDD, with fast 7200 revolutions per minute, "only" achieves a transfer rate of 78.6 MB/s in HDTune. We tested the laptop's gaming qualities in practical use with four current games. 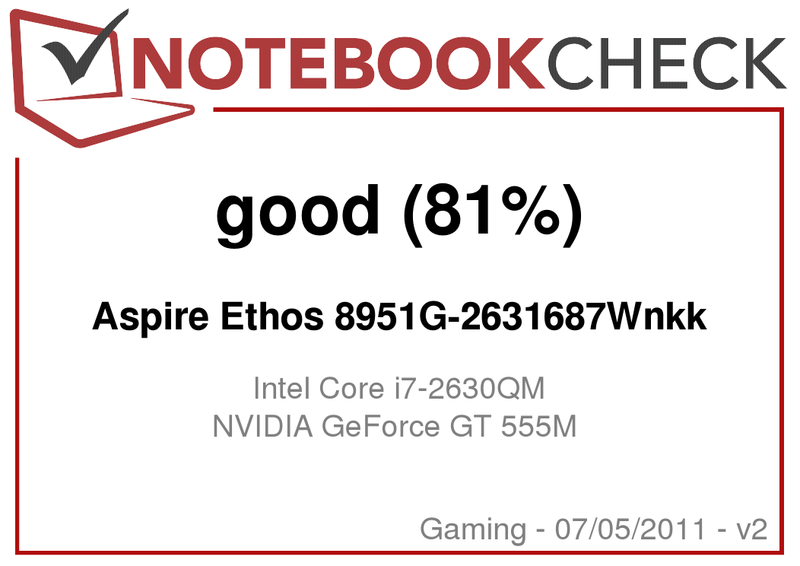 The Acer Aspire Ethos 8951G presented quite good results. All four tested games ran smoothly in minimum and medium detail levels/resolutions. The games hardly ever stuttered even in a high detail level and resolution of 1366x768 pixels. The gaming capacities first found their limits under the hardest conditions. Battlefield Bad Company 2, Mafia 2 and Dirt 3 are no longer possible. Merely Call of Duty: Black Ops is still fairly playable. In terms of throttling, the respective benchmark results didn't show any irregularities, even if it can't be completely ruled out considering the observations made in the test. 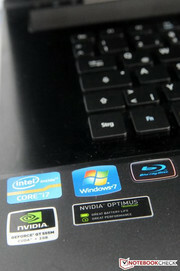 The Acer Ethos sometimes settled down in the front area, and sometimes in the back, compared with GT 555M GPU notebooks. Our Acer Aspire Ethos 8951G test model is still fairly quiet and hardly makes any noise in idle. Then again, we measured rates between 34.2 dB(A) and 37.2 dB(A) in office mode. Thus, the laptop is partly quite audible. The notebook still remains quiet when a DVD is used with measured 36.1 dB(A). The fan really first turns up under load. Our maximum measured rate was 29.9 to 42.5 dB(A). The laptop attracts attention more evidently here. This rate could be described as a bit disturbing in an otherwise quiet surrounding. The temperature development is still relatively low in idle mode. The case's surfaces heat up to an average of 26 degrees Celsius (top) respectively 25.4 degrees Celsius (bottom). There isn't any major difference noticed compared to room temperature. We want to make the system work up a real sweat with a stress test. For this, we used both Furmark and Prime95 for several hours. The laptop's surfaces got a lot warmer if not even hot. Acer's Aspire Ethos 8951G reached peak values of 46.1 degrees Celsius on the top and 47.7 degrees Celsius on the bottom. Using the notebook on the lap can get very uncomfortable with that. The fingers even clearly feel the heat while typing. The processor's clock rate dropped to 1696 MHz during the stress test. The score was also a bit lower in the subsequent 3DMark06 than in a cold state. The system only achieved 9869 points instead of 10068 points. The performance difference wasn't subjectively noticed in the tested games. You would expect a good sound system in a good multimedia notebook. The Acer Aspire Ethos 8951G meets this expectation. Acer installs a 5.1 surround system that's without equal. The competition can learn a lesson from it. The sound is clear and the subwoofer, located on the laptop's bottom, delivers good bass. The sound also only distorts marginally in maximum volume. 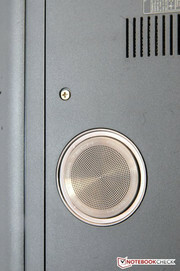 Should you nevertheless prefer external loudspeakers, there are three sockets available for this. In addition to the standard headphone out, a S/PDIF port and a HDMI interface is provided. The power consumption correlates to the observed battery runtime. The notebook consumes a maximum of 22 watts in idle mode. The rate multiplies in full load. Acer's Aspire Ethos 8951G consumes about 108.9 watts when both Prime95 and Furmark run simultaneously. Thus, the maximum power consumption is only a bit lower than its predecessor (117.2 watts). The battery is built into the multimedia laptop. The 6000 mAh 8 cell battery can only be replaced by unscrewing the Acer Aspire 8951G. We checked the maximum possible battery life of Acer's laptop with BatteryEater's Reader's test. We disabled modules, such as WLAN, set the brightness to the lowest level and turned on the energy saving mode for this. The system only lasted of 300 minutes. That is over an hour less than its predecessor. The 18 incher lasts for 222 minutes when the user only surfs on the Internet (WLAN) and sets the brightness to a tolerable level. We simulated the battery runtime in load with BatteryEater's Classic test. We set the energy setting "high performance" and the maximum brightness level for this. The test came to its end after 1 hour and 8 minutes. Basically, a solid performance for an 18 incher, but nevertheless worse than its predecessor. Acer has revved up and slightly modified its Aspire Ethos. The 18 incher provides a good performance with the Intel Core i7 2630QM processor and the graphics card NVIDIA GeForce GT 555M. The installed 16 GB DDR3 main memory stand for themselves, but will provide an additional benefit anytime soon. The additionally installed SSD also contributes a noticeable performance gain in routine use. The other equipment is up to date. A USB 3.0 hasn't been left out and Bluetooth 3.0 +HS is also installed. The system convinced us with its strong application performance. The built-in 5.1 surround system impressed us in the test. The 18 incher's workmanship is just as solid. The removable touchpad is a nice idea. However, it shouldn't be the sole reason for buying. Nevertheless, the system includes a few drawbacks. The display isn't worthy for an almost 1700 euro model. Acer has made cutbacks in the wrong place. A stronger graphics card would also have been desirable, or at least the NVIDIA GeForce GT 555M,, equipped with a GDDR5 VRAM. The detail levels and resolution have to be reduced (HD) in current games for a smooth game play. Beyond that, Acer doesn't exploit the Intel Core i7 2630QM CPU's potential to the full. The quad core processor has problems with the Turbo Boost function and can't really take off compared to other systems. While this isn't as important for the average user, gamers should consider this behavior more skeptically. Here, we can see that the display isn't anti-reflective. There aren't many vents at the rear. The notebook's battery can't be removed. 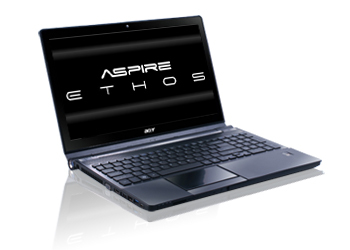 The Acer Aspire Ethos 8951G-2631687Wnkk is the Ethos range's new top model. Nvidia's Optimus improves battery life. Acer has also not forgotten a fingerprint reader. The subwoofer on the laptop's rear does good work. The touchpad can be taken out of the Acer Aspire Ethos 8951G. We especially liked the 5.1 speaker arrangement in the test. A proper display would enhance the Acer Aspire 8951G considerably. The removable touchpad that can be used as a remote control.